In front of family, friends and the public at the Moʻoheau Bandstand in Hilo, Hawai‘i, Sen. Kaiali‘i Kahele announced his plans to challenge U.S. Rep. Tulsi Gabbard for her congressional seat for Hawai‘i’s 2nd Congressional District on Monday, Jan. 21, 2019. Rep. Gabbard has announced her intentions to run for the president of the United States in 2020. He also said it was on Martin Luther King Jr. Day, three years ago, that he found his father, Senator Gil Kahele, collapsed at home. The beloved figure in Hawaii’s Democratic Party died nine days later without ever leaving the hospital. Sen. Kaiali‘i Kahele. Courtesy photo. Through his grief, Kahele felt a call to public service and a desire to follow in his father’s footsteps. 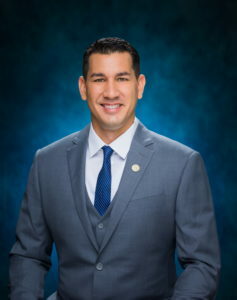 Kahele said during his time serving in the State Senate, he has met with a host of residents. 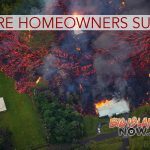 Their many concerns include the future for Hawaiʻi’s children. But in order to achieve this, Kahele said Hawaiʻi needs teamwork, focus and dedicated leadership. In his speech announcing his candidacy, Kahele acknowledged some will ask, why now? Sen. Kahele currently represents the 1st Senatorial District, which encompasses the greater Hilo area on the Island of Hawai‘i. Sen. Kahele is a Native Hawaiian whose family comes from the small fishing village of Miloli‘i in South Kona. 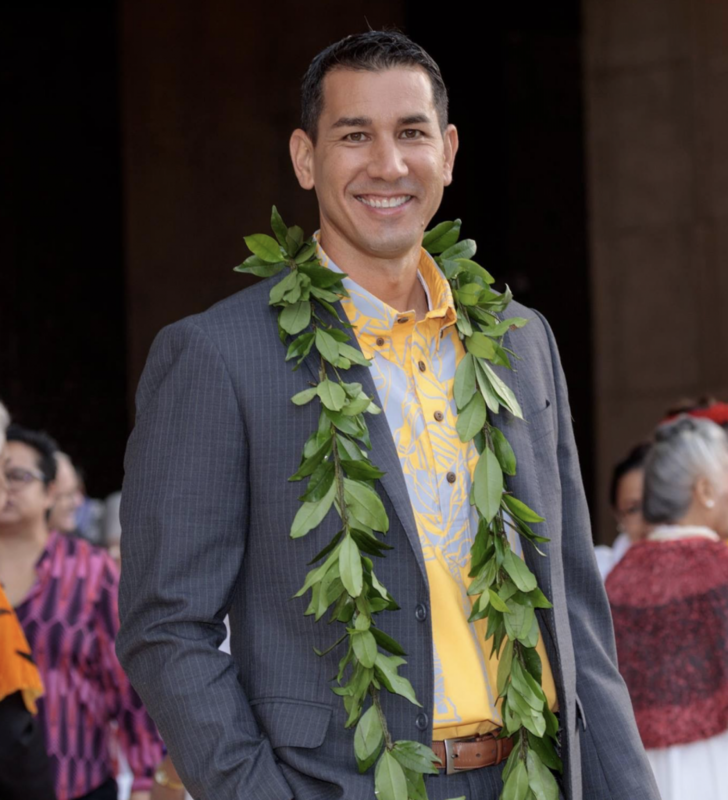 A product of Hawai‘i’s public school system, he graduated from Hilo High School, attended Hawai‘i Community College, the University of Hawai‘i at Hilo, and earned his degree in education from the University of Hawai‘i at Mānoa in 1998. He is a Major in the Hawai‘i Air National Guard and a combat veteran pilot in the C-17 Globemaster III, USAF cargo aircraft. 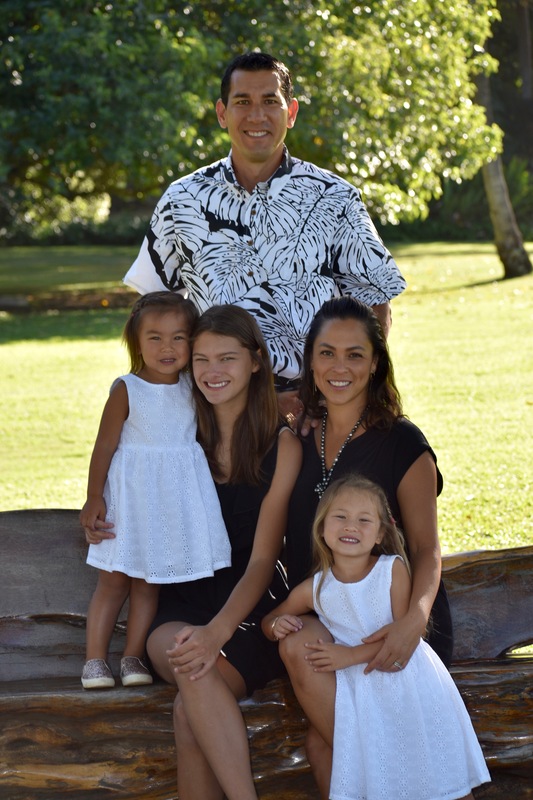 He is also a commercial airline pilot with Hawaiian Airlines and a husband and father of three daughters. A strong proponent of job creation, he is dedicated to strengthening workforce opportunities and small business in the State of Hawai‘i. He also continues to be a champion for the growth and development of higher learning institutions in Hawai‘i and firmly believes they are one of the main economic drivers of communities. On Feb. 16, 2016, Gov. 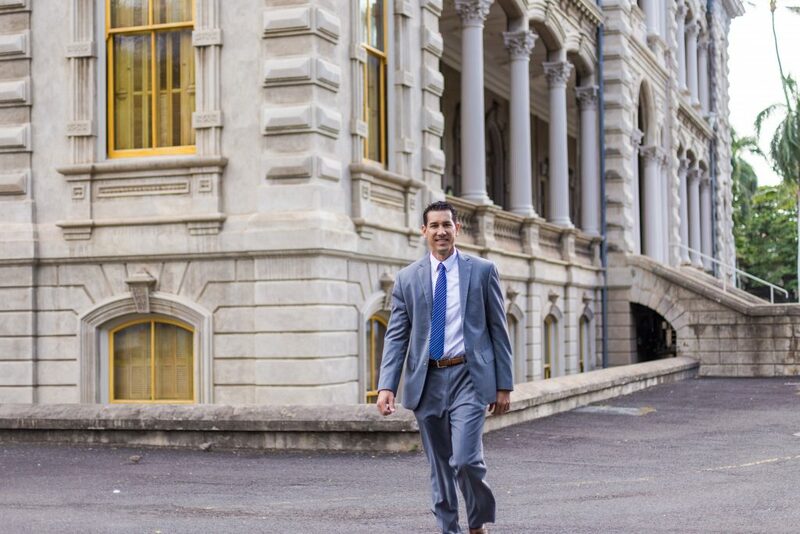 David Ige appointed Kahele as senator for the 1st Senatorial District. He was sworn into office on Feb. 17, 2016, during the 28th Legislative Session and was subsequently elected on Nov. 8, 2016. Sen. Kaiali‘i Kahele and his family. Courtesy photo. 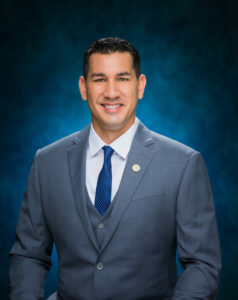 For the 2019 Legislative Session, Sen. Kahele is the Majority Floor Leader and serves as chair for the Committee for Water and Land, vice-chair for the Committee Hawaiian Affairs. He also serves on the Committees for Ways and Means as well as the Committee on Higher Education. A website called Kai Kahele for Hawai‘i, set up by the group Friends of Kai Kahele, is now functional. Aloha Hilo! Thank you so much for being here. Maria and I are truly grateful for all of you to take the time to spend this special moment with both of us, our girls and our family today. I want to begin by saying mahalo to each of you. Those who came from the neighbor islands, my colleagues in elected office, my friends, family and supporters. Thank you for joining us on “Day One” of this journey. We are so very moved by your presence here. Growing up here in Hilo as a young boy, I was inspired by my hero, my Dad, Gil Kahele. Dad loved Hilo. He loved its people. He loved being around people. Listening to people. Serving people. Helping people throughout Hawaiʻi find solutions for their problems and their adversities. His legacy was his passion for public service and helping others. What a tremendous gift he instilled in his children, that same love of people and that same love of service to community. We miss him, and I know many of you miss him too. I think about him everyday. 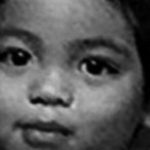 Today is also a bittersweet day for our family, because it was on Martin Luther King Jr. Day, three years ago, when I found my Dad at home having a heart attack struggling to survive. Nothing ever prepares a son or daughter for that moment, but I realized my Dad needed medical attention immediately. As we quickly left the house for the hospital it never occurred to me, or my Dad, or my Mom, that as we raced out of the driveway this would be the last time he would leave our family home, never to return again. When Dad passed nine days later, I realized my call to public service. Our family needed leadership. Our community needed leadership. There was work left undone, and a legacy to carry on inspired by his dream. The dream of this gentle, Hawaiian man from Miloliʻi, to build a better Hawaiʻi for us all. That dream led me to the Hawaiʻi State Senate and the opportunity over the last three years to hear from, meet with and talk to people all over this community. Through those intimate conversations they have shared with me their hopes and their dreams and what they want to do in their precious lives. They have also shared with me their concerns, their struggles, what keeps them up at night and the economic challenges many face living in Hawaiʻi. When I think of them, I think of my own daughters and your children and the Hawaiʻi of the future they will grow up in. And like every parent, we all want more for our children than we had for ourselves. We want the brightest future for them. We want them to have a secure job sustained by a strong and thriving economy. We want them to grow up in a safe community, and a clean environment. We want them to be able to attend outstanding public schools and have access to quality and affordable healthcare when they need it. We want them to be able to walk in our ohia forests, swim in our oceans rich with marine life and see the Hawaiʻi that we have seen through our eyes. But in order to achieve this, we need teamwork. We need focus. We need dedicated leadership and a aspirational vision. We need passion and compassion. We need courage and collaboration. We need commitment and humility. We need elected leaders working together, leaders who put the common interests of Hawaiiʻs people ahead of their own. And that is why, under the historic bandstand here in Hilo, where the hopes and dreams of generations came together to unite around a greater vision for Hawaiʻi that I humbly stand before you today to announce my candidacy to represent the people of Hawaiiʻs Second Congressional District, in the United States Congress. If you never forget that we are all in this together, that we are always stronger together, and if we are united as one, there is no challenge we cannot meet, no obstacle we cannot overcome no destiny we cannot fulfill and if you believe in that, I promise that we are going to build the Hawaiʻi that we have always talked about but have never been able to fully achieve and through the greatest gift Hawaiʻi has to offer, ALOHA, we are going to march this Country and State forward to a better and a brighther day. Mahalo Nui Loa and Imua Hawaiʻi!